I've been hearing of so many strange health/beauty/fitness things people are trying. Steam-cleaning your nether regions (not kidding! ), brushing your teeth with dirt, taking charcoal weekly as a cleanse... What are some strange trends you've been hearing people do in the name of health? Lightening your eye color by putting honey in your eyes. You are supposed to make a solution of distilled water and honey and put it in an eyedropper bottle and 2-3 times a day, you put a drop or two in your eyes. Its for people who want to go from brown eyes to hazel or green. I've also heard of mothers using breastmilk as a diy facial mask ingredient? When I was in high school there was a fad where teen girls would have diamantes stuck to one of their teeth by beauty salons. When they smiled it made them just look like they had a big hole in their tooth lol. haha I remember this trend!!!! Fish giving your feet a pedicure!!! Apparently some fish like to eat the hard skin off feet!! I love a good pedi but not sure I could stand fish nibbling.. Yes! I forgot this existed. 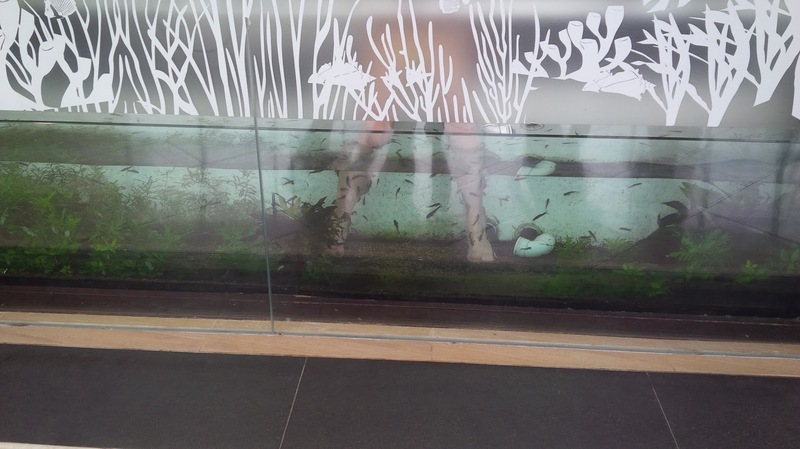 I took a picture of this while in Singapore at the "Fish Spa". First time (and last time) I saw it. Pretty funny because this was at the storefront, so everyone passes by and gawks at you while your dead cells are being eaten away. Ha ha nothing relaxing being watched!